Your opponent cannot target “Magician”, “Performapal”, or “Odd-Eyes” cards in your Pendulum Zones with card effects. You can target 1 other face-up card you control; destroy it, and if you do, add 1 “Odd-Eyes” card from your Deck to your hand. You can only use this effect of “Sky Iris” once per turn. You know you’re getting old when a Pendulum support card is a “throwback”. This card was really good for its deck. Protection from targeting, being able to fuel your Pendulum pile so you can recycle the monsters and a searching ability. And it’s an asset you can use every turn. Sky Iris is a Field Spell that has a far reach when it comes to who benefits from its use. Magician, Performapal, and Odd-Eyes are protected against targeting effects while in the Pendulum Zone, eliminating things like MST and Master Piece from messing with your zones. For Odd-Eyes, the support continues with a 1-for-1 destruction for draw ability. ANY card other than Sky Iris can be destroyed on the field, not limiting you to Pendulum Zones. Many of the Odd-Eyes monsters gain effects off being destroyed, or activate effects on the field when another Odd-Eyes card is destroyed, netting you a better result. Also, it is any Odd-Eyes card, including their spell/trap cards. The range this card has in regards to protection, along with its searching for Odd-Eyes makes it a great card. Sky Iris is a good Field Spell Card and has been for a while. A once per turn searching effect is better than the protection effect, but having both is also good. The protection effect is versatile in that your opponent cannot target Magician, Performapal, or Odd-Eyes cards in your Pendulum Zones. The search effect makes you destroy any of your other face up cards to search any Odd-Eyes card once per turn. Searching is key and Sky Iris lets you do it potentially for free because so many cards gain additional effects when destroyed. Finally, Terraforming is a thing that brings all Field Spell Cards up a notch. 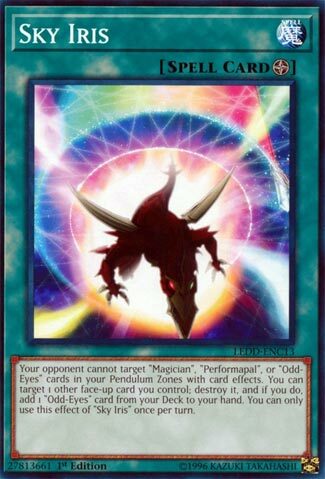 We are looking at one of the first Odd-Eyes support cards from the Pendulum Magician Structure Deck in 2015 for Throwback Thursday this week, Sky Iris. While on the field, Sky Iris prevents your opponent from targeting the Magician, Performapal, and Odd-Eyes cards in your Pendulum Zones. Pendulum Decks would love to protect their scales, and with this one card, three archetypes can protect them. As a hard once per turn, you can use Sky Iris to destroy another face-up card you control and search for an Odd-Eyes card. Having fuel for a Pendulum Summon and getting a search at the same time is outstanding. This can also help trigger Arc Pendulum Dragon, as well as search for an Odd-Eyes Fusion which is basically live if you can Pendulum Summon. One of the best archetypal Field Spells, it does so much for several popular Pendulum Decks. Look at that, a playable Field Magic card. Sky Iris works well, obviously in and out of Odd-Eyes Decks, as it adds welcome protection to them, as well as Magicians, and even Performapal cards. Even if the protection only works for the Pendulum Zone. The latter effect won’t benefit a player who isn’t using Odd-Eyes, but as for that, you’re able to once a turn, destroy a separate card you control to add an Odd-Eyes card from your Deck to your Hand. That makes gaining whatever piece you’re waiting for very easy, and it’s a welcome addition to the Deck.